"Right now the three largest PBMs control 85 percent of the pharmaceuticals. We're talking big, big money folks," Rosendale says. "It requires that the amount that a health insurer pays for a prescription be the same amount that the pharmacy receives for the drug, no spread," Williams said. 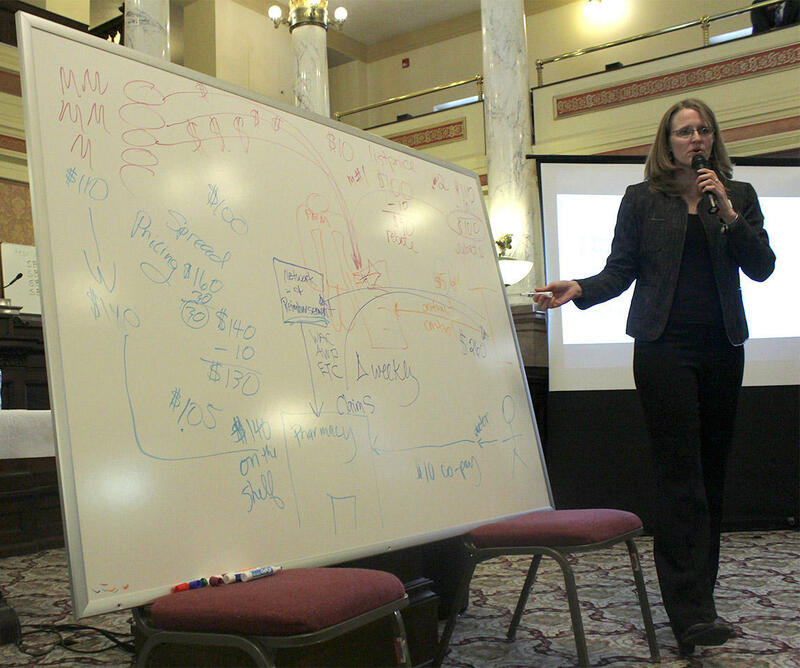 Montana Auditor's Office Chief Legal Counsel Kris Hansen draws a diagram while explaining the concept of pharmacy benefit mangers during a lobbying effort for SB71 on January 17, 2019. Although Rosendale’s office says the end result of their legislation is to change the behavior of PBMs, nowhere in the bill is "pharmacy benefit manager" or "PBM" written. The bill directly regulates insurance companies, reaching through them to get PBMs. That has three of Montana’s biggest health insurance companies worried. "It is of great concern to us that we could be fined for the actions of another party,” says Richard Miltenberger, the chief executive officer of the Montana Health Co-Op. Miltenberger says his company already doesn’t allow spread pricing and kickbacks that can inflate the cost of prescription drugs. Montana Health Co-Op and Pacific Source Health Plans both told lawmakers that drug costs are a big part of the cost of premiums. Jennifer Hensley with Pacific Source says PBMs help lower drug prices. She says it’s another part of the supply change that deserves the scruity: drug manufacturers. Pharmacy benefit manager companies also object to the bill. They say it will tie their hands during negotiations and lead to higher drug costs. But Marc Whitacre, a doctor in Havre, says PBMs use policies like rebates, clawbacks, and spread pricing to make their companies money, and as a result, significantly increase the price his patients pay. Both Republicans and Democrats on the Senate Business, Labor, and Economic Affairs committee have given indications they will support the bill. The proposed new regulations would only apply to the market for individual health insurance plans in Montana, which make up less than 10 percent of all policies. Far more Montanans get health coverage through plans from their employers or government plans like Medicare and the VA. The bill, carried by Republican Albert Olszewski was not immediately voted on today. A separate bill considered by its sponsor as a companion to SB 71, that targets PBMs relationships with retail pharmacies, was unanimously approved by the Senate earlier this week.